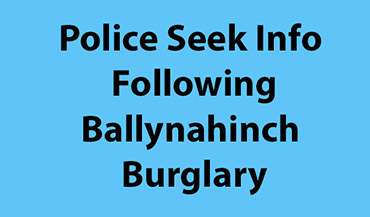 Detectives are investigating the report of a burglary at a house in the Dromore Road area of Ballynahinch on Monday 18 February. Detective Sergeant Johnston said: “It is believed that the burglary took place around 12.30pm on Monday. This would have been a frightening experience for the occupant, who was home at the time. “The intruder made off, by foot, with a number of pieces of jewellery and a sum of money. We were able to retrieve some of the jewellery items, which were discarded nearby. Detective Sergeant Johnston is also encouraging members of the public to protect property and belongings by ensuring that properties are kept secure, particularly during the hours of darkness. He said: “It is advisable to limit the valuables and cash you keep in your home, and remember, safes can be removed. “Remain vigilant and report any suspicious callers or vehicles to the police. This includes cold callers or services being offered at inflated prices. If you do have CCTV systems, please ensure that they are working, and please look out for elderly or vulnerable neighbours and check on them regularly. “If you would like further advice on home security you can contact your local Crime Prevention Officer on 101.